When I say Lamy 2000, most people who are somewhat into pens will probably know what I’m talking about. You probably know how great it is, and that it’s history goes way back. 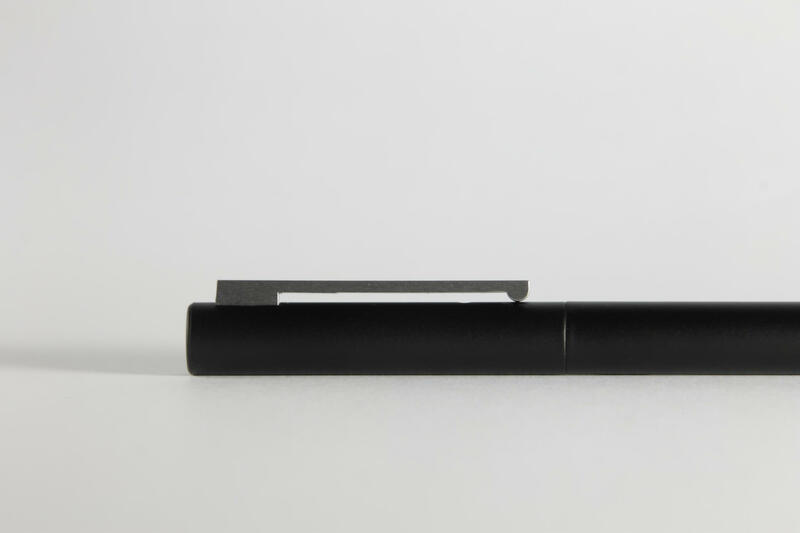 In short: the Lamy 2000 is a true icon – but, it’s not the only pen Gerd A. Müller designed for the German company; a few years after the 2000, he came up with this – the CP1! A quick look is all it takes to spot the similarities between the 2000 and CP1, and it’s not hard to imagine that these two pens were designed by the same person. The CP1 shares it’s matte black body with the 2000, even though this time it’s not makrolon, but coated metal. You’ll also find the distinctive, brushed steel clip although it does have a slightly different shape. 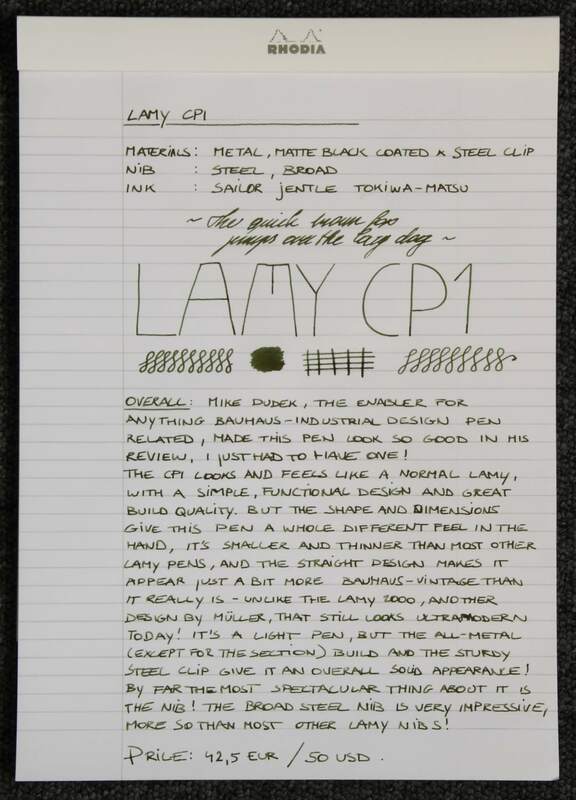 Something I’m sure a lot of people will agree on is that the CP1 looks like it’s a much older design that the Lamy 2000. The clean, simple lines feel retro, whereas the 2000 feels space-age. But nothing is what it seems; the 2000 was designed years before the CP1 first went into production. 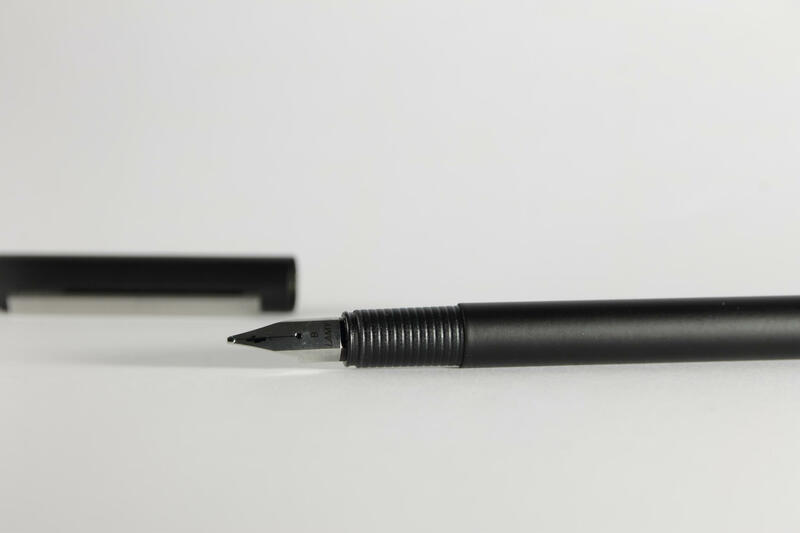 It’s hard to write a review about pretty much any Lamy pen without using the word ‘Bauhaus’. Which is a good thing, in a way, because that’s what Lamy really stands for. The CP1 is, perhaps even more than the 2000, a perfect example of what Bauhaus is all about. It is utilitarian minimalism at its finest. 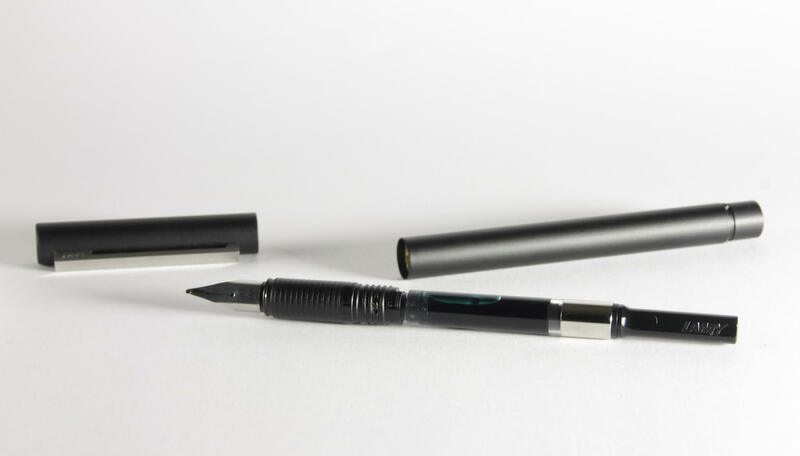 The uniform, cylindrical shape of the pen helps giving it it’s distinctive looks. 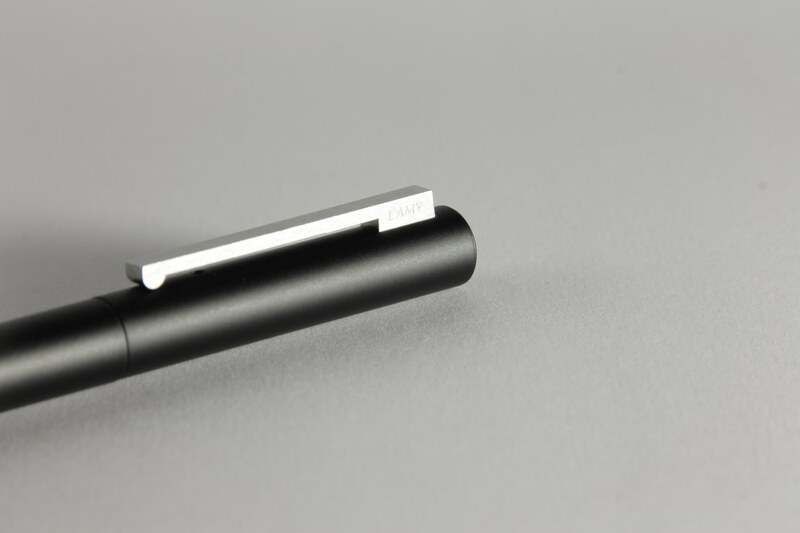 As with the 2000, you won’t find any branding except for the small Lamy logo engraved on the side of the clip. The Matte black metal body is soft to the touch and feels solid. The small, ribbed grip section is made out of plastic, and it has a nice texture to it. I would have preferred a completely metal build, but everything feels solid so there’s no real reason to complain. 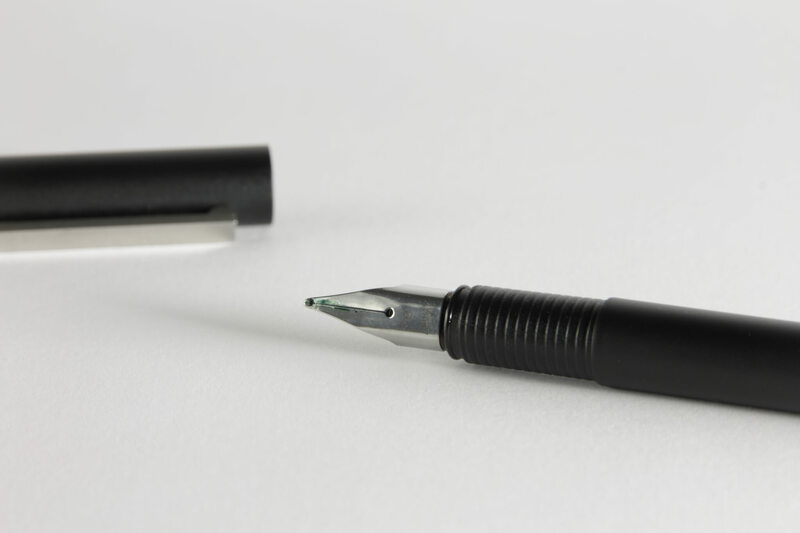 As with the 2000, the CP1 also uses a snap-on cap (like most Lamy pens). The cap clicks into place with a satisfying snap, and even though I prefer screw-on scaps, it has to be said that a snap cap is much easier and faster to use. When it comes to dimensions, I was actually quite surprised to find out that the CP1 is not that large. 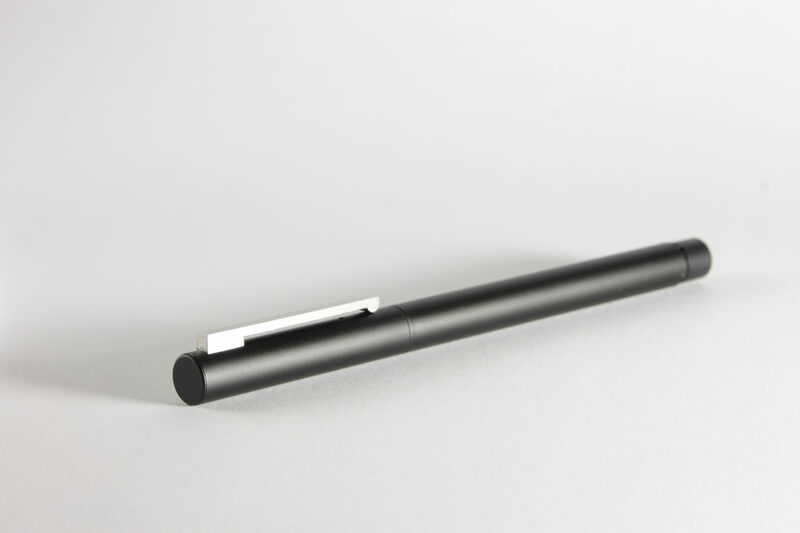 Of course it’s a thin pen, at only 9.5mm. But it’s also relatively short when uncapped. Closed, it comes in at a respectable 13.5cm, but uncapped, it’s only 11.7cm, which is a bit on the short side. The section is relatively short, so you’ll probably keep your grip close to the nib, which makes it appear longer than it actually is. Posting the cap is possible, and it does so very securely due to the specially formed end of the barrel. I do think it looks a bit ridiculous when posted, but it’s definitely easier to use this way if you have larger hands. Despite the metal build, it’s a very light pen, at well under 20 grams. The balance is off by just a bit when posted, but it’s really not that bad. Overall, I was quite surprised by how comfortable this pen is in use. The textured plastic grip section, along with the light weight makes it a joy to use. And even though it’s narrower than what I’m normally used to, it didn’t cause any fatigue. I chose the Broad nib for this one, a size I’ve actually never tried before in Lamy’s offerings. I really fell in love with this nib. Together with the 1.1 calligraphy nib, in my eyes, these are the best steel Lamy nibs you can get. It has a very consistent, relatively wet flow, and it kept up really well. The good thing is that – if you feel the need to change – you can easily swap out the nibs for a few pounds. If you ask me, Lamy is always a solid choice. Their pens are solid, decent writers with excellent value for money. 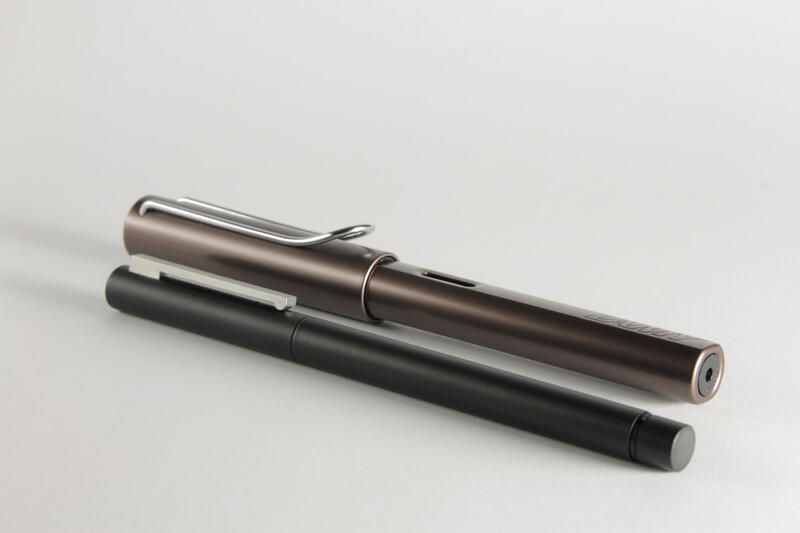 The design is somewhat different from most other pens these days, but that’s part of the success behind their products. 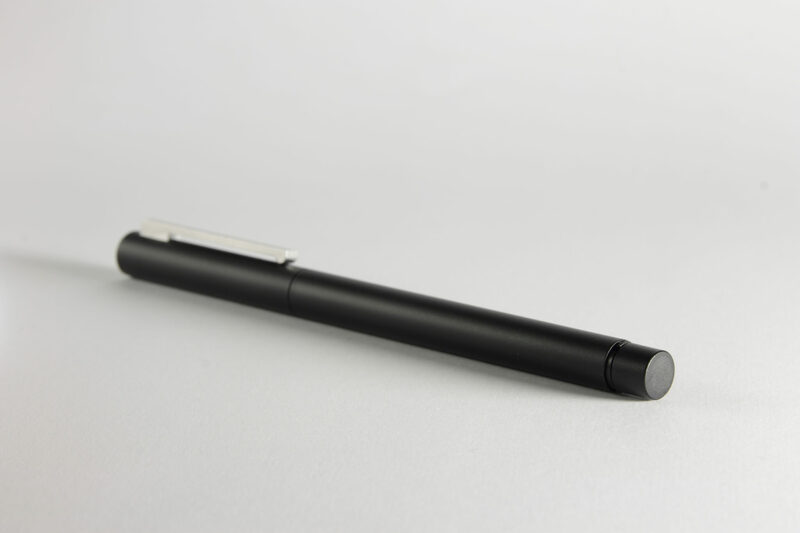 The CP1 is a great pen, it has a manageable size and weight, and has a great retro-ish design. The modest price (36.5 GBP) shouldn’t be a deal breaker either.